Our sedentary lifestyles have added unwanted bulges to our frame. A heavy figure is not only unattractive but also unhealthy. Excessive weight gain is the precursor of major chronic and fatal diseases. Exercise is the key to drop weight fast and safely. But exercise becomes more effective when you apply the right movements and use the right exercise equipment. Working out on an exercise bike has been touted as one of the best weight loss solutions. Here are tips to buy the best exercise bikes losing weight – one that’s useful and one that will guarantee the best value for your money. How to Choose the Best Exercise Bikes Losing Weight? When it comes to lose weight there are two models – the recumbent model and the upright model. The main point of distinction between the two designs is their seating arrangement. The seat on an upright bike has a vertical position while that on a recumbent bike is reclined. Now the main question: which among these models? Both are effective, but the upright model emerges a winner. The upright model allows for a more strenuous, high-intensity workout. Thus, it boosts metabolism and helps burn stubborn fat at a faster rate. The recumbent model also helps lose weight but in the quest of reducing strain on crucial leg joints, it makes the workout less taxing. This automatically reduces the extent to which a recumbent bike can drop weight in comparison to an upright model. However, if you suffer from knee and back pain and are desperate to lose weight, the best type is the recumbent bike. Once you’ve made up your mind on the type of bike you want to purchase, it’s time to examine individual details. We start with the ability to adjust height. Most exercise bikes are made to standard height and allow users to adjust the height to their comfort level. This is an important factor if there will be multiple users of the same bike. The seat is the next factor that needs thorough inspection when purchasing the exercise bike. At the store, sit on the bike. Ensure it fits you properly and is comfortable. Many exercise bike models also allow users to replace the existing seats with better quality seats. If the model you are looking at incorporates this feature, it is an added bonus. The pedals, whether in an upright bike or a recumbent bike, should be wide enough to accommodate your foot. It should have straps to secure your foot when riding. Also, they should rotate smoothly and be easy to operate. A very important feature that you should pay attention to when out on the market to purchase the exercise bike is the ability to adjust resistance. Every individual has a different fitness level. A good exercise bike is one that provides an adjustable exercise workout. Adjustable tension helps you customize the workout to your personal requirements. Further, it allows you to increase workout intensity as you get stronger and your fitness level increases. Thus, it keeps your workout challenging and ensures that you do not hit a plateau. It has long been debated whether one should buy an exercise bike with a heart rate monitor or not. According to many, it is a must-have feature on an exercise bike, irrespective of it being the best exercise bike or the simplest. A heart rate monitor helps you measure the intensity of your workout as well as track the progress of your workout. Many upright and recumbent exercise models also include features such as reading racks, mileage trackers, speedometer, odometer, calorie counter, water bottle holder, headphone jack and book rack. These are optional features and whether you should have them or not on your best exercise bikes losing weight is a matter of personal preference. Before we jump to the section on pricing and warranty, we would like to address a more important aspect – safety precautions adopted by the manufacturer. One should bear in mind that the moving parts and those that pose danger should be covered with a safety shroud. It will protect you from mishaps as well as children and pets should they ever come in contact with the machine. Finally, think about the price. Recumbent and upright exercise bike models can be purchased for as low as $200 to as high as $1500. 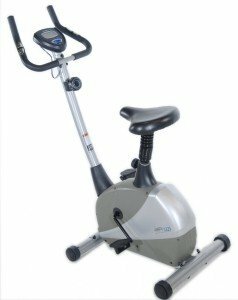 There are a number of cheap, good quality exercise bike models on the market. On the basis of your budget, shortlist a few models and choose the best in terms of your physical requirements. Buy a model that has good warranty not only for the product but also for the components. The name Schwinn has become synonymous with exercise bikes. Many of the models of this brand are among the top rated ones. It features a unique, full-body cardiovascular exercise bike with synchronized arm and leg motion. It provide a progressive resistance system that offers infinite levels of challenge to help you to achieve your goal. The LCD console allows one to track calories, speed, time, distance and RPM. The Stamina 5325 Magnetic Resistance Upright Exercise Bike is renowned for the magnetic resistance system it uses. It ships with 6 preset exercise routines. Also, the battery-operated monitor displays information on time spent, distance covered, calories burned and speed. This model is built to last. Also, the inbuilt sensors in the handlebars record the pulse rate as you workout. I am sure you don’t want to use your exercise bike as a stand for out-of-season clothes after paying a heavy price for it. So, do your bit of homework and find the best exercise bike to lose weight.